Bank stocks have done well since the election, but these three could climb even further in 2017. Since Donald Trump was elected president, financial stocks have gone straight up. There is good reason for this -- Trump's pro-growth policies and his opposition to regulation are a combination that can produce an excellent environment for banks to make money. Here's why the next several years could be good for banks, plus three choices that could be a great fit for your portfolio. Why the rally in banks? In a nutshell, banks have rallied recently for two main reasons, both of which have to do with Trump's election and the Republican majorities in Congress. First, Trump has been outspoken about his opposition to regulation, and few industries are more burdened by regulation than banks -- particularly the big banks. Trump has pledged to repeal or modify Dodd-Frank and generally make it easier for the banks to do business, which would save the banks significant money in complying with regulations. Second, Trump's tax cuts and other pro-growth policies could create an environment that is ideal for banks to make money. They are widely expected to lead to higher interest rates, which generally translates to higher profit margins for banks. Also, lower taxes mean more money in people's pockets, which means more deposits in the banks. Wells Fargo (NYSE:WFC) had an interesting 2016, to say the least. Rocked by the infamous "fake accounts" scandal when it was revealed in September, the bank's shares sold off initially. Then, the stock rebounded and more -- up 15% in November alone and reaching a new 52-week high in December, mainly thanks to the election-related boost I discussed earlier. In addition, the election and ensuing bank rally got the media attention off Wells Fargo, as my colleague John Maxfield pointed out in a recent article. Even though Wells Fargo certainly did a bad thing, and there could still be fallout from the scandal to come, it's important to keep the big picture in mind. Wells Fargo is still the best-run big bank in the business in terms of risk management and efficiency, and the fact that it continuously earns better returns on equity and assets than the rest of the "big four" banks is proof of this. 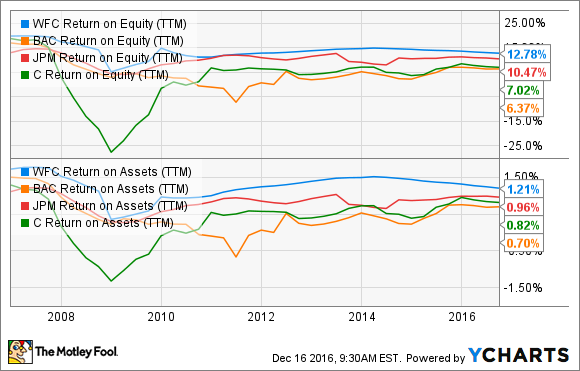 WFC Return on Equity (TTM) data by YCharts. At the end of the day, Wells Fargo isn't likely to lose a significant number of customers over the scandal. Also, remember that the 2 million fake accounts weren't generating any real revenue for the bank -- if anything, they may have cost Wells Fargo money in the form of employee incentives for meeting sales targets. Wells Fargo's largest shareholder is Warren Buffett-led Berkshire Hathaway, and Buffett has said he hasn't sold a single share of Wells Fargo in the wake of the scandal, and has no plans to do so. Buffett went on to call Wells Fargo an "incredible institution," and that he still has faith in the company. Wells Fargo remains the most rock-solid of the U.S. banking giants and is worth a look. If you have a little bit more appetite for risk, consider Bank of America (NYSE:BAC), which accidentally became my largest stock holding over the past few months. I say "accidentally" because when the stock was trading in the $11-13 range earlier in 2016, I jumped on the opportunity to add some shares to my position. Now that it's doubled, my position has grown accordingly. However, even with the recent gain, I have no plans to sell a single share. The recent Federal Reserve interest rate hike is a positive catalyst for all banks, but Bank of America stands to benefit more than most. Even more importantly, the slightly improved forecast of three more rate hikes in 2017, two or three in 2018, and three in 2019, with a longer-term target of 3%, is a good indicator that the bank's profitability could grow more than the market thinks. In a recent SEC filing, Bank of America estimated that a 100-basis-point move in interest rates would add $7.5 billion in net interest income per year. So, it's fair to say that if the Fed is correct in its projections, Bank of America's annual net interest income could easily rise by an 11-figure sum. And if President-elect Trump's economic policies and infrastructure investment generate as much growth as he claims, the Fed's forecast could prove to be quite modest. Finally, keep in mind that even though it's doubled in price since early 2016, Bank of America's stock still trades for a discount to its book value of $24.19 per share. As a final suggestion, if you have a long investment time frame and want to potentially get in on the future of banking, you might want to take a look at BofI (NYSE:AX), which stands for Bank of Internet. As the name implies, BofI does its business exclusively online -- it has a single office location in California, and no branches whatsoever. Through its internet-only platform, BofI offers a full range of banking products, such as checking and savings accounts, mortgages, CDs, auto loans, and more. The bank's business model is simple. Online and mobile banking is rapidly growing in popularity, and non-branch transactions are much cheaper, so the bank aims to operate more efficiently than its competitors. Over the past few years, the bank has successfully transitioned away from a CD-based model to a more traditional portfolio of checking and savings products. As a result, deposits have nearly tripled since 2013. It appears to be working so far. The company's growth over the past few years has been spectacular. In fact, BofI's EPS has grown at an impressive 32% annualized rate over the past five years, and despite this growth, the stock trades for less than 15 times trailing-12-month earnings. Also, despite the rapid growth, the bank's charge-offs and non-performing loans are well below the industry average, and it holds more than enough in loan loss reserves to cover itself even if every non-performing loan ended up defaulting. Data source: BOFI investor presentation. The bottom line is that there is a bank stock for you to buy in 2017, whether you prefer the stable, tried-and-true banks, have a little more risk tolerance, or want to potentially get in on the next big thing.